Physically, Groasis is a plastic box that holds about a bucket of water initially and has a dough nut shape. The tree saplings are planted about 15 inches from the top of the soil and the box placed over the sapling so that it pokes through. The corrugated top that is placed on the top of the bucket, has special properties which allows it to condense dew from the atmosphere. Thus once the sapling has been planted, there is no need for any further care including watering the sapling. There is more than 95% chance that the tree will survive the first year and find deep source of water underground. After one year the box can be taken out. Over a ten-year cycle ten plants can be potted. The Groasis Waterboxx, an invention of Pieter Hoff. The boxes have been successfully tried out in desserts and barren mountains, including mountain tops that get covered with snow for part of year. Groasis Boxxes can be a wonderful boon for Jodhpur, Barmer, and Shekawati regions of India. They could re-forest Western Ghats also. In India the box has to be imported from Holland and costs about Rs 2,000 freight and duty included. The cost of the hole to be dug and the cost of the sapling are above this cost. Two trials have been done in India. The first trial was done by Indian Navy at an island near Mumbai that hosts a Coast Guard station, INS Trata. 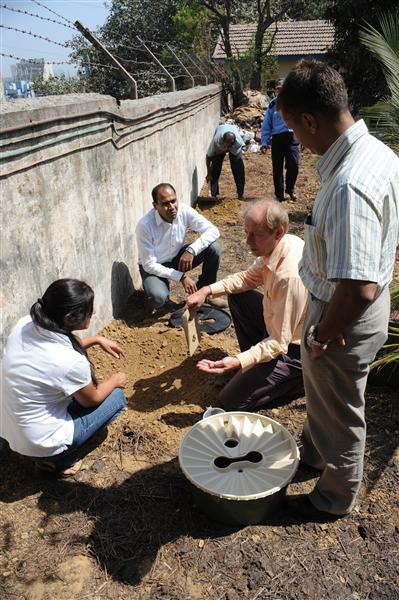 Pieter Hoff plants the first Groasis Waterboxx in India at INS Trata, Mumbai, 2010. The second trial was done in 2011 by BAIF Research Institute at Ahmedabad using 50 liters instead of 10,000 liters per date palm for the first year. The BAIF research team give water to the plant with the Groasis Technology in one year 50 liters only, September 2011, September 2011. The BAIF research team together with Mr. Mitul Shah and Mr. Jan Lindeman from Indo Dutch Consultancy, April 2012. 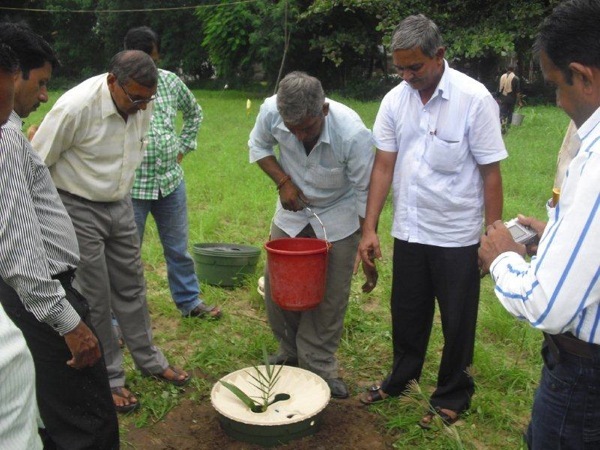 By March 15, 2013 BAIF started further trials of a total of 39 Waterboxxes at Champawat (Uttarakhand), Barmer (Rajasthan), Nanodara, Kutch, Chaswad (Gujarat), CRS Urulikanchan (Maharashtra) & Lakkihalli (Karnataka). The plants selected for trials include pomegranate, water melon, musk melon, mango, lemon, ber, chiku, brinjal, okra, tamarind. The BAIF research team with Mr. Pieter Hoff at Barmer, Rajasthan, placing the Groasis Waterboxx carefully over a sapling of Cordia dichotoma (common name Gunda tree). A progress report issued by BAIF in March 2015 reveals plant growth to be satisfactory at most places. Plant growth courtesy Groasis Boxxes at BAIF research sites, March 2015. Tree crops – All forest species preferably with single stem grown in arid & semi-arid conditions. Fruit species with straight trunk (least spread type) suitable for arid & semi-arid conditions. Single stem, least spread species will enable easy removal of Waterboxx after the initial six months / one year. Vegetable crops like bottle gourd, ridge gourd, okra, brinjal etc. Essentially anything that grows with a single stem and does not spread too much in the first year before the box has to be removed, is good to plant with the box. If six or seven types of trees of the above type were to be planted in the rain shadow area of Western Ghats in 20 boxes what trees would they recommend? I have been thinking in terms of planting 3 trees of six types and two trees of the seventh type making a total of twenty. Its important that we choose well as what we chose is likely to get replicated across many villages of the region. I have evolved the following somewhat contradictory thinking in this regard. Some trees should be for people i.e. they should give shade and bear human edible fruits for example 'immali'. Some trees should be for the birds and bear fruits that birds eat for example fig. Some trees should be for the bees and bear flowers that bees can pollinate and make honey. Rubber tree as rubber is also a part of sugar chain. Mahua trees which are near native to W Ghats and would satisfy all three parts of first criteria. I am wondering if any varieties of Canadian Maple would grow in this habitat. Bamboo also has high sugar content. Should it be tried? Traditional text recommends growing Ashoka trees near human settlement. Presumably this is based on the fact that the tree has no branches (so to speak) and is always covered with leaves giving out high amounts of oxygen. Groves of Ashoka could be inter-planted at a later date between the trees. Groasis boxxes have been used to grow tomatoes and vines. But with box costing about Rs 2000 as capital cost, this is not viable for the ordinary vegetable farmers. If the team has the time I would like to discuss with the team an experiment to grow vegetables using a very limited outlay ( Less than Rs 50 per vine) that works on two out of three principles of Groasis box. Would it be worthwhile trying out a transplant of tree that is three year old with a Groasis boxx? In regions near here, experiments have been done by planting big branches of the trees. Can Groasis help? Youtube video of Superhydrophobic coating - Repels almost any liquid!